What is the Source of Batman’s Villains: Gotham or Batman Himself? I’ve been doing research on a major upcoming article on Batman but unfortunately it is not ready. However, while I have been combing the literature, films, video games, and TV shows, I came face-to-face with an interesting question that has pondered Batman fans and creators alike for the past 30 years or so. What is the source of the Batman’s crazy villains, Gotham or Batman himself? To the casual person, this may be surprising; Batman, one of the most famous superheroes of all time, is the source for his own antagonists. But to anyone who has been exposed to Batman before, this idea is not farfetched. There have been times where he not only causes a supervillain to be born but he actively encourages their existence as well. Many of the supporting characters in Batman’s world, such as the Gotham Police Department, psychiatrists, hell, even Hugo Strange accuse him of making Gotham worse because of his supervillains. Opponents to this argument, however, firmly believe that Gotham City is the source of madness. This is perhaps a more recent argument though I could be wrong here. While growing up, I always assumed Gotham was just like any other big city; yeah, it may have its fair share of problems but it’s still a place many people would call home. This is further highlighted by the rest of DC’s cities as Metropolis, Central City, and so forth have their supervillains as well. But Gotham’s status as a truly messed up city was not brought to my attention until Nolan’s Batman Begins where Ra’s al Ghul wanted to purge Gotham of its sin by killing everyone in it. You might think this is an overreaction to how bad Gotham is but if you go through the literature, you begin to realize how right Ra’s was (except for the genocide, that’s bad). Gangs own the city, police officers look the other way, city leaders are corrupt, and simple necessities like safety are just non-existent. And through this corruption, normal people become corrupted and turn into the supervillains that we know and love today. Both of these arguments have some merit of truth but which has the stronger influence? Let’s dive in and find out. Spoilers for Arkham Asylum and City, Gotham as well as a host of other Batman universes. Let’s start off with a controversial subject, the Joker. I think the Joker is probably the best example for this argument. In some interpretations (such as the Burton movies or the Killing Joke) Batman is indirectly involved in creating his arch-nemesis. To me, I’m totally fine with that as it makes the rivalry that much stronger. But many people like a Joker that has no background, one whose origins are as mysterious as his motives. Even so, some people interpret Joker as the living embodiment for the force of Chaos with Batman as the symbol for Order. Joker knows that Batman has a strict code of honor and he tests, goads, and pushes Batman to his limits. I first became aware of this symbolism in the Dark Knight where Joker’s actions eventually came to experiments Batman and wondering if he can break him (“an unstoppable force meets an unmovable object”). These two opposing forces, which have rarely been equaled, make them the most famous superhero and supervillain combination ever. I think the best example of this comes from Miller’s Dark Knight Returns. When Batman retired, the Joker became catatonic and could barely function. He had lost his purpose, he had lost his drive. But when he saw that his best friend had made a return, he fully recovered. It was like nothing had ever happened. And their rivalry and battles in the comic I think is among the best in Batman history. Of all the sources you can use, this is probably the pristine example of Batman promoting his enemies. The Riddler is another fine example of Batman promoting his enemies. This guy’s ego is something. He yearns to prove his intelligence. He wants to be three steps ahead of everyone else and laugh at them for their stupidity. Only Batman can match his riddles and put a stop to his crime. This only further stokes the Riddler’s ego as he wants to find that Riddle that can even outsmart the Batman. 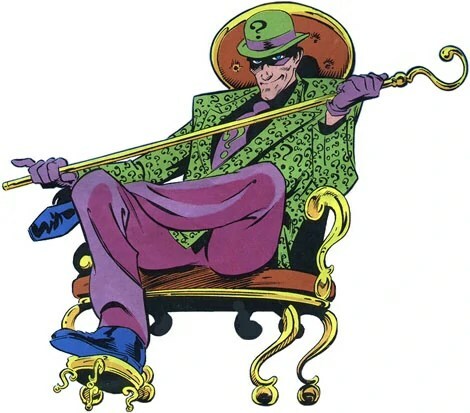 I assume that if Batman decided to not even play Riddler’s game and leave him alone, the Riddler would go mad and not know what to do with himself (he would probably go into a catatonic state such as the aforementioned Joker in the Dark Knight Returns). …Janet Van Dorn defends Batman and breaks down each of the witnesses’ accusations by saying they were the cause of their insanity and crimes, not Batman. Jervis Tetch would have still kidnapped the girl he pined for and Poison Ivy would have still been the Bioterrorist she is today. Even so, the Animated Series does not support this side of the argument that Gotham causes supervillains, to find proof, we’ll have to look elsewhere. 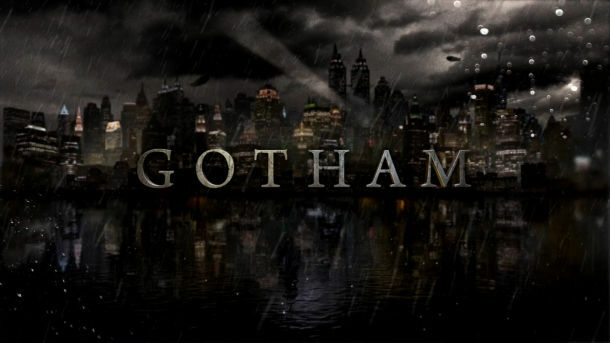 I want to get the TV show Gotham out of the way first. I think it would be cheating to use this as a source to prove that Gotham makes its own villains. Mainly, when you see a Batman-prequel, you want to see all the bad guys and what they are up to. As such, many of them are already messed up. Zsasz, Penguin, and even Ivy are already sadistic, cunning, or just plain odd. And Harvey Dent is…errgh…let’s not go there. Regardless, there is one scene I want to talk about from Gotham. In episode 8 of Season 1, “The Mask,” Gordon and his Captain were musing why Gotham had a sudden surge in crazy people. They then supposed that the source was from the death of the Waynes. Their deaths caused the city to lose hope and begin this spiral of insanity. I kind of like that, it points to why we see these weird people coming forth and doing awful things. I think one of my favorite explanations for crazies in Gotham, surprisingly enough, comes from the video game Arkham City. Now, this is subtly imply so take this for what you will, but if you solve some of Riddler’s riddles, you are revealed the story about Wonder City and holy crap I love it. In old Wonder City, Ra’s Al Ghul’s Lazarus Pit had caused all of the city’s inhabitants to go insane and be transferred to Arkham Asylum. And guess what? Lazarus Pit is directly beneath Arkham City! I love it! The Pit could be the reason why so many people just go insane in Gotham. Real direct proof does come from Arkham City though. In the Victor Zsasz side mission, he explains to you over a series of phone calls how he became the wonderful person he is today. When he was financially broke, he decided to gamble his last bit of money at the Iceberg Lounge. Eventually, he came to the final table with the Penguin himself. However, the Penguin and his goons had scammed poor Victor and he lost everything he had. Defeated, he walked through the streets of Gotham and found his first victim and…er…relieved him from his sorrow of this world. This is pretty good proof how Gotham’s messed up nature can lead to its supervillains. I think by far the best example of Gotham creating its own supervillains come from none other than Harvey Dent aka Two Face. Here is a man who fought against the corruption and cowardice of Gotham. Elected on a fair campaign of a promise for a better tomorrow, he fought tooth and nail to clean the streets of Gotham. His do good attitude had even made him a suspect in many different universes that he may be Batman himself. But his obsession and his passion drove him to a breaking point. When the acid was flung to his face, he had changed. A change that was driven by the incomprehensible evils of Gotham. And through this change, he split. Half still retaining his do-good attitude, and half mirroring the ugly city that had created him. What do you think? Both have their elements of truth but which do you think has the stronger influence? The Caped Crusader or the Worst City Ever? I want to hear what you have to say! This entry was posted in Comics and tagged Arkham City, Bane, Batman, Comics, DC, Gotham, Joker, Ra's al Ghul, Riddler, Two Face, Zsasz on December 15, 2014 by Andy.